Illegal occupant of the palace of the Inca Huiracocha, the cathedral was built with blocks extracted from an Inca site very close to Sacsayhuaman. It began to be built in 1559 and was completed almost a century later. To its right is the church of the Triumph (1536) and the one of Jesus Maria (1733) to the left. 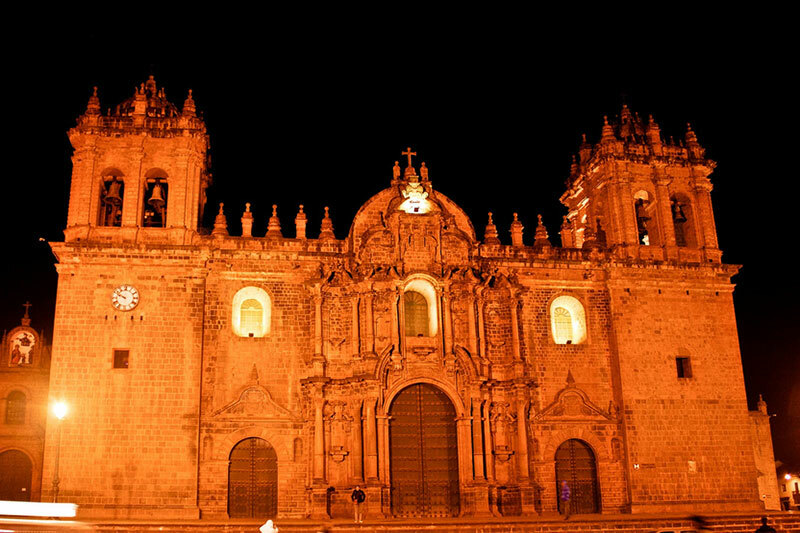 The church of the triumph is the oldest one of the Cusco; In it, a vault contains the remains of Inca Garcilaso de la Vega (Cusco 1539 – Spain 1616), its remains were returned by the king Juan Carlos of Spain in 1978. The cathedral is one of the largest repositories of colonial art in Cusco; Houses countless works of the Cusqueña school, combining the styles of European devotional painting of the 17th century with the symbology of indigenous artists from the Andes of Cusco. If you pay attention you will see many unique details; One of the most outstanding representations is that of the Virgin Mary dressed in a skirt in the form of a mountain, with a river that descends around the fold, alluding to the Pachamama (mother earth). The Cathedral of Cusco is located on the north side of the Main Square of the Cusco has a rectangular design composed of 14 pillars carved in Andesite stone. In the central nave is the main altar engraved in silver and consecrated to the Virgin of the Assumption; Behind this is the choir stalls made of pure cedar. The cathedral has 14 side chapels, in these you can see beautiful works of art, paintings, altars and many statues of Saints and Virgins. Below the right side of the main altar there is a small arched crypt, which contains the ashes of many deceased Cusco archbishops; In the Church of Triumph (next to the cathedral) you will find the small crypt of the chronicler Garcilaso de la Vega, author of “the real comments of the Incas”; The crypt possesses half of its ashes in a small urn, the other half are in Spain. 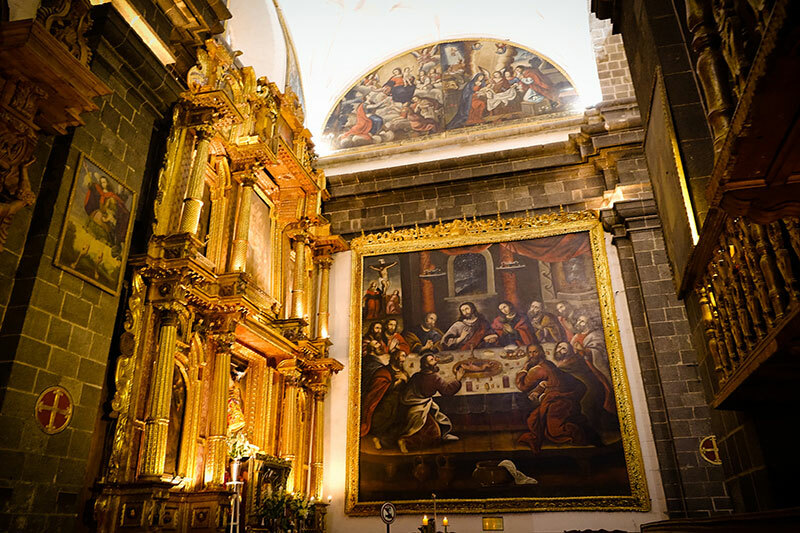 This unusual painting of the last supper is on a wall between the Cathedral and the sacristy, measuring 5 x 4 m. And was painted by the master Cusco Marcos Zapata; In this, the traditional easter lamb, is replaced by a vizcacha (wild Chinchilla Andina). In the cosmology of Andean culture the vizcacha was the spiritual guardian of lakes and mountains. 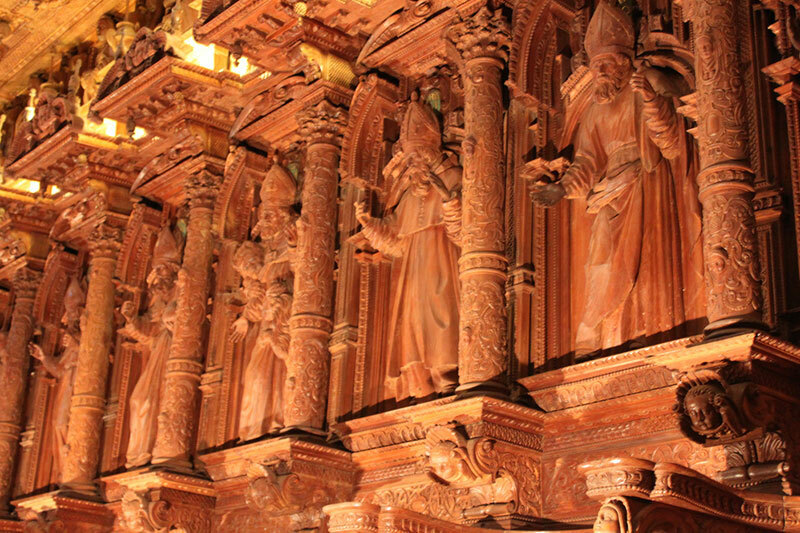 The sillería is a must visit inside the cathedral, it is located in the inferior part of the central ship and is made of pure cedar, of style “neo-archaic” very popular in the Spain of the centuries 15 to 17. The black statue of Jesus’ crucifixion is an emblem of Christianity in Peru. An old legend tells that when the statue was moved from Europe to Peru, a ferocious storm threatened the lives of the people who were aboard that ship. Despair at an imminent death caused the crew to put the statue on its feet, the storm instantly calmed down. The sacristy of the Cathedral is on the right side of the main altar. Its walls are dominated by portraits of the previous bishops of Cusco, beginning with Vicente de Valverde (1499-1541). The sacristy also has a large altarpiece titled “Christ of the Agony,” a huge cedar wood carved without any baroque style guide. His 8 paintings represent passages of the life and miracles of San Pedro. To enter the Cathedral you will need to buy the Religious Circuit Ticket which includes a visit to: The Cathedral, San Blas Temple, Archbishop’s Museum and San Cristobal Temple. Monday – Sunday from 10 am At 6 pm. Foreign adults: S/. 25 (US $ 8.00). Foreign Children: S/. 13.50 (US $ 4.00). Foreign students with Student ID Card: S/. 13.50 (US $ 4.00). Photos and videos are not allowed.